This is turning into the Manton / Euro-Wheels website! 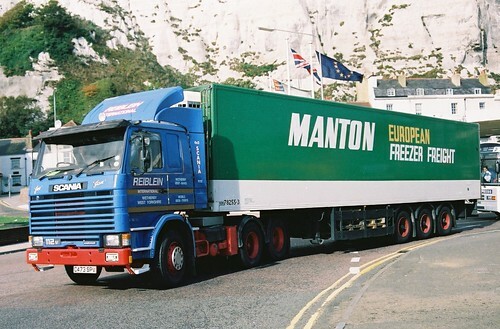 Neil Jarrold knows we have quite a long standing Manton’s run on the blog, so know when he has unearthed another pile of photo’s and he come’s across another Manton’s truck, he feels obliged to send it to the blog. I think it’s fair to say this is a rare sight. As yet I don’t think anyone has said anything about Manton’s subbies, so please please dust off your memory bank’s and fill the rest of us in on the details. This very clean Scania 112, is a 6×2 tag axle, belonging to Reiblein International of Wetherby. Now i’m not the oracle of Yorkshire hauliers, but I don’t think I have heard of Reiblein before. Just for info C reg vehicle’s were from 1985. Some of you will know what’s what, so get email me at; ben@truckblog.co.uk or leave your comments below. I look forward to penning Part 7 shortly!! This entry was posted in International Mega Trucking, Photos, Scania by truckbloguk. Bookmark the permalink.